Merrimack: A river formed by the junction of Permigewasset and Winnipesaukee Rivers at Franklin, N.H., flowing across northeastern Massachusetts before emptying in the Atlantic at Newburyport, Mass. 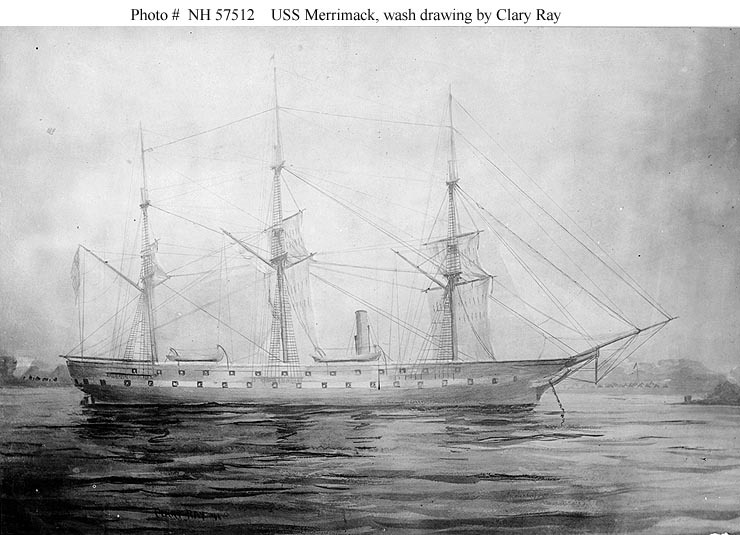 The second Merrimack was launched by the Boston Navy Yard 15 June 1855; sponsored by Miss Mary E. Simmons; and commissioned 20 February 1856, Capt. Garrett J. Pendergrast in command. Shakedown took the new screw frigate to the Caribbean and to western Europe. Merrimack visited Southhampton, Brest, Lisbon, and Toulon before returning to Boston and decommissioning 22 April 1857 for repairs. Recommissioning 1 September 1857, Merrimack got underway from Boston Harbor 17 October as flagship for the Pacific Squadron. She rounded Cape Horn and cruised the Pacific coast of South and Central America until heading for home 14 November 1859. Upon returning to Norfolk, she decommissioned 16 February 1860. Merrimack was still in ordinary during the crisis preceding Lincoln’s inauguration. Soon after becoming Secretary of the Navy, Gideon Welles took action to prepare the frigate for sea, planning to move her to Philadelphia. The day before the firing on Fort Sumter, Welles directed that “great vigilance be exercised in guarding and protecting” Norfolk Navy Yard and her ships. On the afternoon of 17 April, the day Virginia seceded, Engineer in Chief B. F. Isherwood managed to get the frigate’s engines lit off; but the previous night secessionists had sunk lightboats in the channel between Craney Island and Sewell’s Point, blocking Merrimack. On the 20th, before evacuating the Navy Yard, the U.S. Navy burned Merrimack to the waterline and sank her to preclude capture. The Confederates, in desperate need of ships, raised Merrimack and rebuilt her as an ironclad ram, according to a design prepared by Lt. J. M. Brooke, CSN. Commissioned as CSS Virginia 17 February 1862, the ironclad was the hope of the Confederacy to destroy the wooden ships in Hampton Roads and to end the Union blockade which had already seriously hurt the South. Despite all‑out effort to complete her, Virginia still had workmen on board when she sailed out into Hampton Roads, 8 March 1862, tended by CSS Raleigh and Beaufort and accompanied by Patrick Henry, Jamestown, and Teaser. Flag Officer F. Buchanan, CSN, commanding Virginia, singled out as first victim sailing sloop Cumberland, anchored west of Newport News. In taking position, Virginia passed Congress and exchanged broadsides, suffering no injury while causing considerable damage. She crossed Cumberland’s bow, raking her with a lethal fire, before finishing off the wooden warship with a thrust of her iron ram. Gallantly fighting her guns as long as they were above water, Cumberland sank taking one‑third of her crew, 121 men, and part of Virginia’s ram down with her. Virginia then turned her attention to Congress, which had grounded. Assisted by the lighter ships of the South’s James River Squadron, Virginia opened fire from a distance, forcing Congress to haul down her colors. As CSS Beaufort and Raleigh approached Congress to receive the surrender of her crew, Federal troops ashore, not understanding the situation, opened a withering fire and wounded Buchanan, who retaliated by ordering hot shot and incendiary shell to be pored into Congress. The latter, ablaze and unable to bring a single gun to bear, hauled down her flag for the last time. She continued to burn until exploding about midnight. Virginia did not emerge unscathed. Her stack was riddled causing loss of power and she was initially underpowered. Two large guns were out of order, her armor loosened and her ram lost. Nevertheless, she went on to attack Minnesota, but shallow water prevented her getting close enough to do her former sister frigate serious damage. Virginia anchored that night at Sewell’s Point for repairs. Flag Officer Buchanan was taken ashore to the hospital and Lt. Catesby ap R. Jones, CSN, who had conned the ironclad after Buchanan had been wounded, assumed command. Shortly before noon, a shot from Virginia struck Monitor’s pilothouse driving dust through the eyeslit through which Lieutenant Worden was conning the ship, and temporarily blinding him. Thinking that the pilothouse was seriously damaged, if not destroyed, Worden ordered the ship to sheer off to shallow water. At the same time Virginia headed back toward Sewell’s Point. Installation of a new ram and other repairs and alterations kept Virginia in dry dock at Norfolk for almost a month. Flag Officer Josiah Tattnall, CSN, appointed 25 March 1862 as Commander of Confederate Naval Forces, selected Virginia as his flagship. Virginia returned to Hampton Roads 11 April; under her protection CSS Jamestown and CSS Raleigh captured three Union transports. Strategic considerations precluded a second Monitor‑Virginia duel. Monitor’s mission was to contain Virginia in support of General McClellan’s campaign on the peninsula, and Virginia safeguarded the important Norfolk area and the mouth of the James River. When forced to evacuate Norfolk, the Confederates tried to take Virginia up the James River, but her deep draft prevented it, so they destroyed her 11 May 1862.